Hire Pennsylvania Magician Eddy Ray And…. Pennsylvania Magician Eddy Ray Exposes His Magic Secrets! 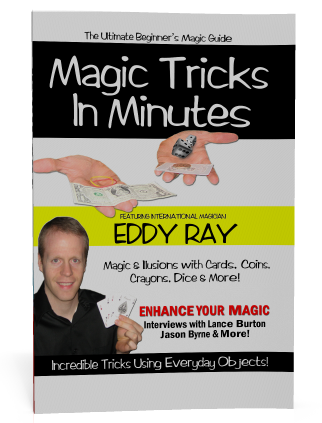 Schedule and book a magic show package today and you’ll receive Eddy Ray’s “Magic Tricks in Minutes” paperback book! Perfect to give as a gift or keep for yourself. You’ll learn some amazing magic tricks using everyday objects. Eddy Ray will also autograph it! To book a show please call 1-877-297-7252 or email us at info@SmileLaughLearn.com . Mention this offer! Limited Time Offer and Supply! Pennsylvania Magician Eddy Ray performs his amazing magic shows for kids and adults throughout major areas of PA such as: Lancaster Pa, Lebanon Pa, York Pa, Allentown PA, Philadelphia PA, Harrisburg PA, and more. Call him today for free information on how he can make your event fun and memorable. !